Register Log In ECN Forum Forums Violation Photo Forum 32 Volt DC Lighting Panel? Here are some pictures of a 32 VDC lighting panel, that the owner wanted me to convert to 120 VAC because he was tired of maintaining the batteries. Instead I built him a power supply from a buckboost transformer, and 4 100 amp diodes on heat sinks. The system dates from the late 20's. I find your site to be very informative, and fun. Interesting looking old panel! I rescued a panel which looks somewhat like this from an old church that was built in 1926 and demolished about ten years ago. The panel was made by Trumbull Electric Manufacturing Co. 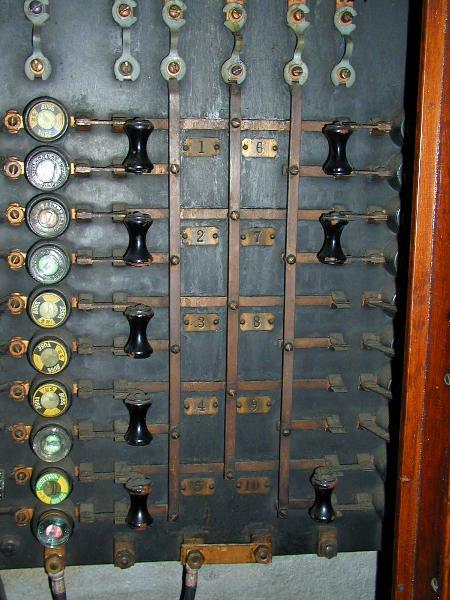 It had two large knife switches (with cartridge fuses) at the top...one which fed a sub-panel for the sanctuary lights, and another for the pipe organ. One question...are those open fuse links at the top of the first picture (above the plug fuses)? Yup, they are open fuse links. 90 amp ones I think. I have to go back and check. There are knife swtiches above the fuse links, I just ran out of picture to include them. You ought to see the voltage regulators and contactors that are on the other side of this system, right out of Frankenstein. What kind of application is this (i.e. service for a house, farm, etc)? Seems like I read somewhere that, in decades past, rural areas used 32 volt generators for a power source since they were so far removed from power company or REA lines at the time. I believe they also used battery powered tube-type radios. Installations like this have a great deal of historical value. BTW, judging from the condition of the slate behind the fuse links, it appears that they have been pretty lucky avoiding overloads or shorts to date! Thanks for your interest. 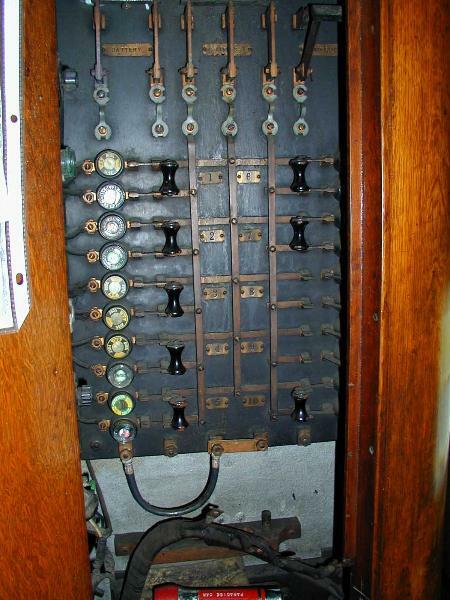 This is the lighting load panel out of a Reading Railroad Co. business car, known as the "Paradise". When it was on the road, being pulled by the train, an axle driven generator charged the batteries, and powered the systems. When you where in the station, there were several tons of nickel iron batteries under the car to power everything. You also had the option, when at the station of powering the car from the station, at 240v 3ph! The car steward had to be well versed in the operation of the very early mechanical air condiitioning system, as well as the electrical system in the car, as you usually had three different sources, and things could get exciting if you got confused. The panel is mounted on a board with some sort of a asphalt based paint, which makes it look like slate. But you are right, I don't think those fuse links melted very often. If you have any other pictures like this and want to send them in with descriptions maybe we could put them in a 'nostalgic' area somewhere on the site. Sorry its been awhile, works gone crazy, and I haven't been able to get back. I have, can get other pictures of "historic" stuff, If anyone is interested. I personally like the old stuff. Knife switches, steam driven generators, big meters. I have learned alot. Thanks for letting me in. I still need to get to the Lowe Motor Inn in Point Pleasant, WV to get some pics of the panels there. Very similar, but with fuse-wire instead of fuses. Neat! Also, the covers are glass, so the innards are visible. Tom, do you ever get to Point Pleasant? Anyone from Ohio live near there? Maybe somebody else can take a look-see too? YES!! Please send some more pix when you have the time. Virgil is right...these old panels are really works of art (as well as darn near bulletproof). If I can ever figure out how to use my daughter's digital camera, I'll try to post some old panels from my collection. Virgil: I'm disappointed!! Looked at the Lowe site and not one picture of those panels (guess they don't know what's REALLY important...just kiddin' of course). Hope you can get back there in time to take some pix before they upgrade... sounds like they're headed that way. Just hope they don't "upgrade" to FPE!